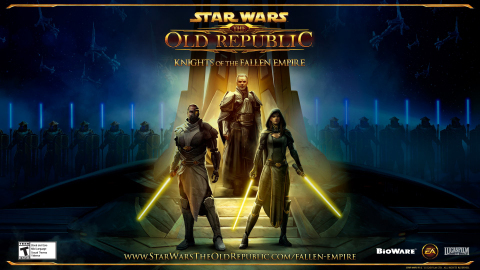 AUSTIN, Texas–(BUSINESS WIRE)–BioWare™, an Electronic Arts Inc. (NASDAQ:EA) studio, and Lucasfilm Ltd.
entry to the exciting universe of Star Wars: The Old Republic. experience a deep and personal adventure. immortal Emperor, Valkorion, whose dark destiny is tied to their own. Starting today, players can join the adventure at www.StarWarsTheOldRepublic.com/play-free. Wars: The Old Republic. For more information, visit: www.StarWarsTheOldRepublic.com/fallen-empire. iconic Star Wars classes, without having to pay a monthly fee. experience Star Wars: The Old Republic. Expansion, Knights of the Fallen Empire, please visit www.StarWarsTheOldRepublic.com/fallen-empire. For additional press assets, please visit http://info.ea.com. PLAY. MUST BE 13+ TO REGISTER. ACCOUNT IS NON-TRANSFERABLE ONCE USED. ALL TERMS AND CONDITIONS TO PLAY THE GAME APPLY AT ALL TIMES.